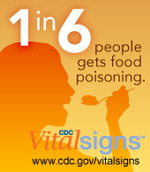 Did you know the CDC estimates that 1 in 6 Americans (or 48 million people) gets sick from contaminated food each year? Most people will recover without a problem, however 128,000 are hospitalized and 3,000 die of foodborne diseases annually. And for some the effects of food poisoning can have long-term health consequences. 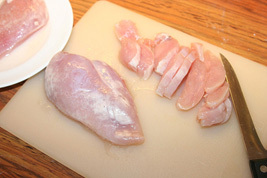 For the past few weeks there has been an ongoing Salmonella outbreak associated with raw chicken products produced by Foster Farms at three facilities in California. According to Wired.com there are seven strains of Salmonella circulating within this outbreak and four of the seven strains are drug-resistant. The CDC reports 1,000 or more reported outbreaks that happen each year in the U.S. reveal familiar culprits—Salmonella, E. coli and other common germs. And health experts know (and people need to learn) that reducing contamination works. During the past 15 years, a dangerous type of E. coli infection, responsible for the recall of millions of pounds of ground beef, has been cut almost in half. Yet during that same time, Salmonella infection, which causes more hospitalizations and deaths than any other type of germ found in food and $365 million in direct medical costs annually, has not declined. Each year, 1 million people get sick from eating food contaminated with Salmonella. Applying lessons learned from reducing E. coli O157 infections could help reduce illness caused by Salmonella. But realize more than 250 different foodborne diseases have been identified and described on record. Most of these diseases are infections, caused by a variety of bacteria, viruses, and parasites that can be foodborne. Myth: It’s OK to thaw meat on the counter. Since it starts out frozen, bacteria isn’t really a problem. Myth: I don’t need to wash fruits or vegetables if I’m going to peel them. Fact: Because it’s easy to transfer bacteria from the peel or rind you’re cutting to the inside of your fruits and veggies, it’s important to wash/scrub all produce, even if you plan to peel it. Myth: To get rid of any bacteria on my meat, poultry, or seafood, I should rinse off the juices with water first. Myth: Marinades are acidic, which kills bacteria—so it’s OK to marinate foods on the counter. Clean. Wash hands, cutting boards, utensils, and countertops. To clean everything effectively use a mixture of 1 teaspoon of bleach to 1 quart/liter (or gallon/4 liters) of water. Also wash cooking utensils used to handle raw meats before you use them to remove cooked food stuffs. And always wash your hands [and under fingernails] after cracking open eggs and handling raw meats of any kind. Separate. Keep raw meat, poultry, and seafood separate from ready-to-eat foods. If possible, use different cutting boards for meats and veggies (or at least always use 1 side for meats and the other for produce) … and wash it with a mixture of water and bleach (see above) to remove germs before turning it over since meat juices can spread. Also use separate plates or dishes for raw versus cooked meats. Cook. Use a food thermometer to ensure that foods are cooked to a safe internal temperature: 145°F (63°C) for whole meats (allowing the meat to rest for 3 minutes before carving or consuming), 160°F (71°C) for ground meats, and 165°F (74°C) for all poultry. Chill. Keep your refrigerator below 40°F (4°C) and refrigerate food that will spoil.